John Paul and Ste make up, missing Scott’s calls about Sinead. Scott turns up at Diane’s flat and Ste blames John Paul for the missed calls and races to the hospital. Later, Joe offers Freddie an olive branch but the pair argues again. In The Dog car park, Freddie runs into gun-wielding Grace who wants to shoot him for killing Fraser and destroying her chances of having a proper family. Kim, Lindsey, Trevor, Mercedes and Darren arrive. Trevor talks Grace down and she drops the gun. They embrace and Lindsey runs over to a relieved Freddie. However, Joe picks up the gun instead and points it at Freddie and Lindsey. Mercedes wrestles the gun from Joe’s hand but it goes off and Mercedes ends up on the floor, has she been shot? Joe drops the gun and runs away. Patrick sees Darren and Maxine kiss. He trashes his office in fury as Theresa walks in. She persuades him to go for joint custody instead but Maxine says no and pursues the case for full custody of their daughter. 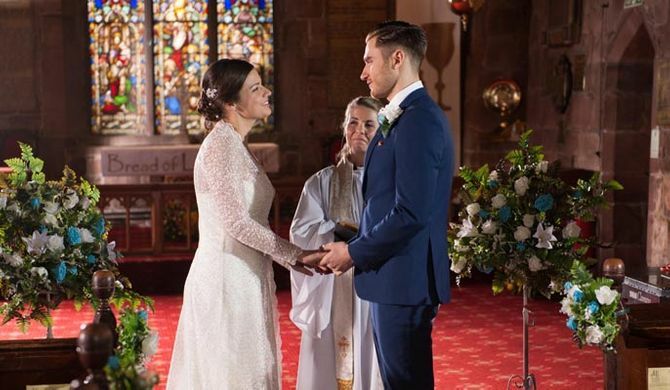 Hollyoaks 23/01 - Can Ste and John Paul save their marriage?